The Denim and Diamonds pony pouch is a safe travel case for your Traditional Size or Classics Size Breyer Model Horses. The Pretty in Pink pony pouch is a safe travel case for your Traditional Size or Classics Size Breyer Model Horses. Set includes Misty of Chincoteague, Stormy - Misty's Foal, and a paperback copy of the book "Misty of Chincoteague"
Foaled in Denmark, this Connemara mare is a grand-daughter of the great Irish Connemara stud Oxenholme Marble. With owner Sean Sunner of Garryhinch Stud, she won numerous in-hand Supreme Championships. LLanarth Welsh Cob Mold. 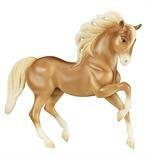 Best of British Breeds series from Breyer Model Horses. Abigail's pinto horse Boomerang is a friendly, well-meaning and loyal steed, but he's also a total goofball! His clumsy nature adds laughs to even the direst of misadventures. Boomerang is 1:9 in scale 8"H x 10.5"L, and is shown loping along. This sea-inspired mare and foal set will sweep you off your feet. Mare Cascade has a metallic pearly blue coat, like the sea at night. Young colt Caspian has a pearly white coat with a touch of soft blue shading. Both of their manes and tails glitter. Champion stallion Cherry Creek Fonzie Merit is a fine example of how excellent conformation, intelligence, and easy temperament make the breed a fantastic "everyman's horse." Mustang gelding Cobra has been beating the odds ever since he met a trainer willing to take a chance. Born in the wild in 2004 and gathered with his herd, Cobra was passed over three times for adoption, making him a "three strikes" mustang. Top show jumper Beezie Madden has been paired with Cortes C, owned by Abigail Wexner, since 2011. He is a 2002 Belgian Warmblood gelding. This very solid cross country obstacle encourages a bold jumping effort in the thrilling sport of Eventing. Eventing, one of three Olympic equestrian sports, has roots in the military, where soldier and horse had to navigate any obstacle in their way. Breyer's Devon Hunt Seat English Saddle is designed to fit most Breyer Traditional Size model horses. Wooden arena comes complete with four corners, eight letter markers, twelve rails and dressage booklet. Empres++++//! The 1995 Arabian stallion was born in Poland, and has competed in Poland, Netherlands, Belgium, United States, and Canada. Owned by Prue Critchley since 2011, she focused Empres' career on both halter and performance.